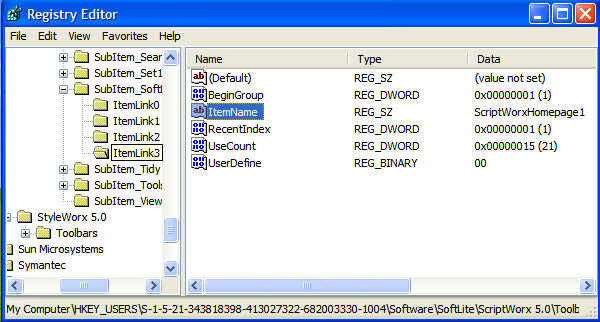 Windows Registry Edit for Advanced Users Only! 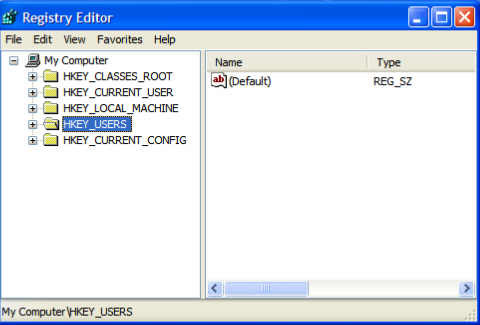 If you go to Start-Run and type in regedit or regEdt32 you will bring up this screen shot (regedit32 is for NT). This is the Windows Registry, be very careful what you do here, if you do one wrong thing, you could crash your computer or at the very least have to reinstall a program or restore the system. This is for Advanced Users, I'm going to show you how to delete old Keys and folders that were not removed by some software you removed using the Add/Remove Utility in the Windows Control Panel. Another way to do this is to download Regcleaner and use it to do this. 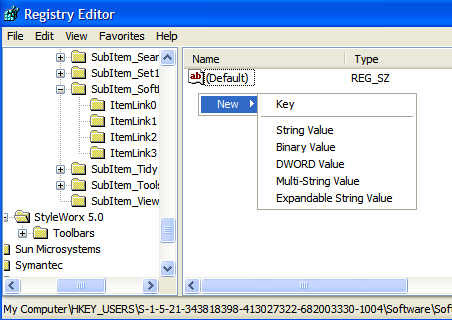 This is the Find Utility for the registry, Edit-Find then Edit-Find Next to find the next entry, before you remove software write down the name of the program, so you can put it into this box and search for it in the registry, after you have removed it. 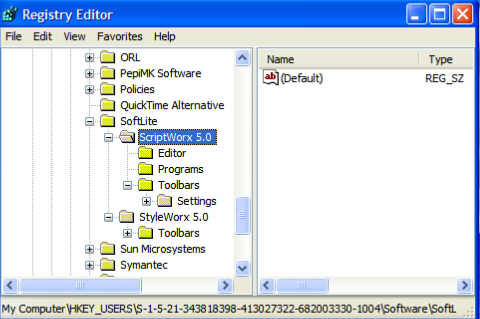 I recently removed a program called ScriptWorx and I will use the Find Utility to clean up the registry entries, you really do not need to do this, in most circumstances, but I had to do this to remove ZoneAlarm an older version, it really messed up my system, until I went in and removed all traces of it, there were 257 Keys and folders I had to delete. But once I removed them, I had no more problems, so their are times when a geek needs to hack the registry. I typed the name in the search box and it found the first entry, the ScriptWorx folder and a lot of them. The folders are on the left pane and the Keys are in the right hand pane. Software is suppose to delete these, but it has been my experience that most do not. This screen shot shows a Key. in this case it is the name of Homepage1, what is that, heck I do not know lol. Notice the different Keys, REG_SZ, REG_DWORD, REG_BINARY, some times when you get a bad virus they give you instructions on how to delete or add a Key in the registry, these are the Keys they are referring to. 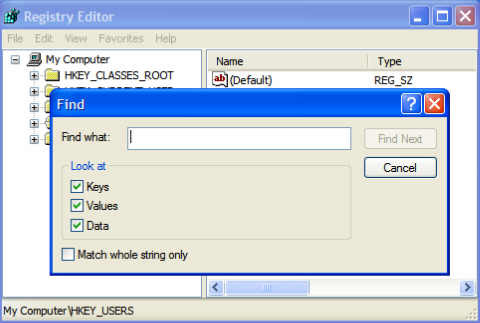 If you right click on that ScriptWorx key and choose Modify, you will get this input box. Here you can change the name of the key, you would only do this if you know what and why you are doing it, otherwise the program will stop working or malfunction. Click the cancel button--------------------lol did ya try lol, anyways, cancel out of that and right click again on it and choose Modify Binary Data, this is what comes up. If you look close the programs name is spelled out in binary code. 0000 53 00 63 00 72 00 69 00 S.c.r.i. Scri first line. You can modify the binary code, would we do that, NO, only when, let say Symantec tells you that it needs to be changed to something else. They always have a little script you can download that makes these changes for you. If you right click and go to Delete this is the screen you see, yes yes get rid of it, lol, be sure you are deleting the RIGHT KEY or Folder, other programs may have a similarly named key. If you right click on an open space this screen will appear, these are all the Values you can delete, add or modify. 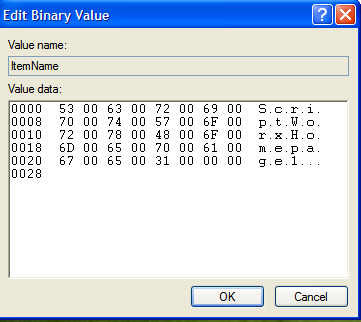 If you choose Key, you will add a new folder, if you choose a value, you would be creating a new Value in that folder. Well that is a short run down on editing the registry, again I say, you need to know what you are doing or do not really care what happens, because you are going to reformat and reinstall the OS anyways. so maybe it will fix the problems. That is actually why I started messing with the registry, figured, heck good time to see what it is all about. You may want to set a Restore Point in XP before you make changes in the registry and in 98 and Me you have a Backup Registry feature in System Information-Tools. Oh ya, lol, I deleted the ScriptWorx, actually the main folder was SoftLite and that was that, Find found no more entries. Sweet! This a very detailed Microsoft Support page on the Registry. I HIGHLY recommend that you look it over before editing the Registry.